Describing the Niagara River’s ecosystem as “a house of cards” goes a long way toward explaining why scientists are so concerned about a three-inch minnow. 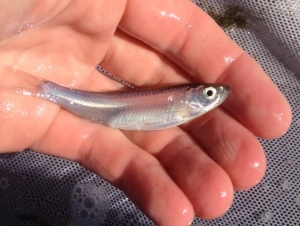 In the Buffalo News on May 18, environment reporter T. J. Pignataro wrote about the emerald shiner, the subject of a unique, multidisciplinary study headed by the Great Lakes Center. Alicia Pérez-Fuentetaja, professor of biology and research scientist with the center, is the principal investigator of the project. Pignataro reported that, as a result of the project, researchers “have gained new insights about the species in the Niagara River…” The findings could prove important not only to Western New York’s aquatic ecosystem but also to researchers around the world. “We’re going to learn a lot at the end of this,” said Bryan Hinterberger, a research collaborator from the U.S. Army Corps of Engineers.